Over the next few weeks we’re going to put the Bryce version of Keen waterproof shoes to the test. Over the past years, we’ve been in love with the Ecco GTX waterproof shoes. Their starting to wear a bit, so after having good luck with Keen products in the past, we decided to take the plunge and see if they’ll be able to live up to their lineage. For their first outing, we’ll be breaking them in here in snowy Colorado. Since we’re in that snow a bit, melt a bit time of year, it should be the perfect test to see if these shoes really do keep our feet dry and warm. Not to be content with just putting them to the test at home, we’re going to pack them up and take them to Zermatt, Switzerland. Will they travel well? Can they handle the rocky terrain of the alps? Will they be comfortable as everyday shoes out on the town? We’ll know soon. Check back with us in early February, when we’ll post our full report. Our review is complete. You can find the final review here. There’s nothing more that’s a pain in the a**, than having your tablet or phone run out of juice. And of course, it always happens at the most inconvenient time. After a long flight. After running around all day. Ugh. Let’s face it. No matter what kind of phone or tablet you have, the “advertised battery life” is never very close to what it is in actual daily use. When we ran across the Dark Energy Reservoir late last year, we thought this could be the answer to our problems. We had looked at portable phone and device chargers before, but they were too bulky or heavy to add to a backpack or carry around all day. The Dark Energy Reservoir intrigued us with it’s light weight and extremely small footprint. Plus, it can charge up to two devices more than once without needing to be recharged. Too good to be true? Well, that’s why we have it “in the lab” for testing to see if it lives up to it’s claims. We ordered a Dark Energy Reservoir right before Christmas in black. We found a deal for $110 vs the suggested retail price of $129. It really is light weight. It seems a bit lighter than an iPhone and about the same form factor. It’s actually around 6″ X 3″ X 1″. It comes with a nifty microfiber pouch, a charger and a USB cable. It has two USB ports on the end, which can be used to charge up to two devices at one time. Spec wise, what is amazing is it’s charge capacity of 8000 mhz. That’s more capability than almost any other, especially in this small size of charger. In the next two weeks, we’ll put it to the test. We’re taking it on a one week journey to Europe. We’ll see how long it lasts on a single charge, charging out two iPhone 5s and two iPad 2s. But that’s not all, we’re also going to put it to the climate test. We’ll take it out skiing for 4 days and see if that affects how long it will stay charged. So stay tuned. In early February, we’ll report back. In the mean time, you can read a few other reviews about the Dark Energy Reservoir as well. From PCMag, Business Insider and GloboTraks. Also, you can watch this video from Dark Energy for more info about the reservoir. Our testing of the Dark Energy Reservoir is complete. You can read the final review here. For our 3-1-1 toiletry bag, we carry the Timbuk2 Clear Flexito Pack. We have both the small and the large. There’s nothing more irritating than having your ziploc bag break open or tear right as you go through TSA screening at the airport. The Flexito solves that problem by being way more durable and has a ton more space to put your liquids in. The only thing you have to remember is to place the clear side up in the bin as you go through security. If you carry more stuff inside of your luggage, you can also use the medium or large size, which has even more room and keeps your travel stuff organized. It’s a bit too big, however, to use as your TSA 3-1-1 bag. Timbuk2 items come with a lifetime guarantee. Everything they sell is built well and built to last. Plus, if you ever get tired of your Timbuk2 bag and want a new one, you can recycle it and get 20% off your next purchase. We absolutely love these GoToob Travel Bottles. We started using these bottles about a couple years ago and we’ve been pretty pleased with the results. They fit very nicely in your 3-1-1 liquids bag. Each one is also easy to fill and refill. Just unscrew the cap and fill. We also appreciate the “textured” surface which keeps them from slipping out of our hands when using them in places like the shower. Don’t be put off by the flexibility of these bottles. The caps really do stay on and we’ve never had one leak. Each bottle has a handy suction cup attached. It’s great in small bathrooms when counter space is at a premium. Just suction it to the bathroom mirror and you’re good to go. The bottles are available in 1.25 oz, 2 oz and 3oz sizes as well as a variety of colors. Because of their unique shape, you can fit a few more into that 3-1-1 bag than ordinary sized bottles. The only drawback to the GoToob bottles is with very thick liquids, like some shampoos or sun tan lotions. If you decide at some point in the future to put something else in the same bottle, it can be a bit difficult to clean. The Jansport Odyssey Backpack is one of the best backpacks around for travel. We’ve used ours for over four years and it’s held up better than we ever expected and most importantly, it carries a ton of stuff and is comfortable to carry. We’ve travelled through the backcountry of Vietnam, the islands of the Maldives to Palm Springs with the Jansport Odyssey and it’s great. From carrying all of the basics: laptop, phones, power adapters, magazines, books, newspapers and a change of clothes, this bag performs. This bag holds a whopping 2350 cu inches of cargo and the exclusive “air-lift” straps make carrying even the heaviest loads, effortless. There are plenty of pockets for storage, including a place for pens, key clip and many zippered compartments. The zippers and material of the bag are top notch. You rarely find many Jansport or many other backpack manufacturer’s keep the same bag “series” or “design” around for more than a year or two at most. The fact that this bag has been around for almost five years is a tribute to its success and popularity. We’ve lived with this bag and give it two thumbs up. Whether we travel in or out of the country, we always make sure to take along our power adapters. With everything that needs to be charged today, laptops, iPods, camera batteries, video batteries, etc., you require an adapter that can handle it. At the same time, the last thing you want to do is lug along some huge powerstrip or heavy adapter with 75 different plug combinations. Before we delve into our favorites, there’s always a lot of confusion over “adapters” vs “regulators”. So, let’s try to clear up some misconceptions. Plug adapters are exactly that. The ability to accept a plug of some type and then via the adapter plug it into a different type of socket. They don’t change the power, they simply allow you to plug your device into a different style of plug. The US runs on 110-120V, while most other countries run on 220v-240v. So, if you plug in an ordinary device that you use in North America into a European socket, you’ll probably end up with a permanently damaged device. Not fun, not pretty and very expensive to replace. If the item you’re bringing from North America has a power supply, (think laptop, camera battery charger, etc) and it’s relatively new, (say the last 5 years) you may be able to use just the plug adapter. You should read the label on the power supply of the device you want to plug in and see what the voltage requirements are. If it has a range, that says 100v – 240v, you’ll probably be fine with just an adapter, like the Kensington below. If it has just a single number on the label such as 120v, you’ll definitely need a plug adapter AND a voltage regulator. The one thing you should NEVER do, is plug in a hair dryer you bring from North America, into an outlet somewhere else in the world. Hair Dryers take a HUGE amount of power and can easily be damaged, catch fire or worse. You should always use the hair dryer supplied by your hotel. There are certain travel hair dryers (their clearly designated as such) which may work in a foreign country. Some come with an adapter you can use. Voltage Regulators can actually adjust or “step up” or “step down” the power source to charge your device. They actually change the voltage that your device receives from the outlet. These usually tend to run rather “warm” when you are using them. Sometimes, they can also have a very faint hum as they change the voltage. 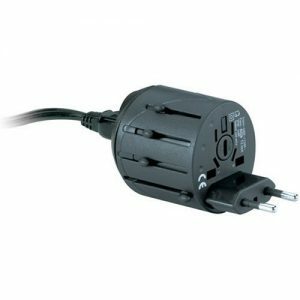 Usually, but not always, if you need a voltage regulator, you’ll still need a power adapter. The power adapter will allow you to plug in the device and the voltage regulator will adjust the power. Voltage regulators tend to be more expensive than just a plug adapter. When in doubt, you should always read your owner’s manual for the device to see what they recommend or call the manufacturer of your device and see what they say. We haven’t used a voltage regulator for about 4 years. We use a plug adapter only when we travel to foreign destinations to charge our Canon video and camera batteries, Ni-Mh batteries, iPod, iPhones and Apple laptops. We haven’t had any issues and its certainly been nice not to carry any extra equipment. We’ve tried alot of different adapters over the years and we’ve used these for the past three. Frankly, we haven’t found anything that works better, nor any that are more compact for the number of outlets offered. 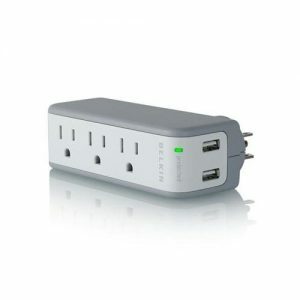 The Belkin Mini Surge Protector works great whether your traveling domestically or internationally. First, you never know how many outlets you’re going to have where you’re staying. There’s almost always a shortage of outlets in any hotel room when you’re in international destinations. Second, how many adapters have more than one 3 prong-outlet and with them positioned on their side so you can easily plug in larger plugs? The best thing about this adapter is that it also has two USB ports on top, that allow us to charge our iPhones and iPods without having to get out our laptop. The one downside of this power adapter is that it’s not small. Who ever thought a plug adapter could be controversial? Well, if you read some of the reviews about the Kensington All-in-One, you may believe that it’s not the right one for you. Let’s dispel some of the rumors you may hear in reviews on the adapter…. (and no, we don’t have any relationship with Kensington). This adapter does work with 3 prong devices. It does NOT provide grounding, even though the 3 prong plug works in the adapter. We’ve used this adapter in Dubai, Germany, Argentina, Chile, Malaysia, Indonesia, Hong Kong, Singapore, Maldives, Thailand and have never had any problems with it working. The one thing we like about this adapter is that it’s small and light. It also works with just about any combination of foreign outlet you’ll come in contact with. The only two downsides of this adapter is that it doesn’t bear alot of weight, so can come out of loose outlets easily. This isn’t a problem in Europe, but is somewhat in Asia, where the outlets tend to be loose. The other is that you have to make sure you push a button on the side before sliding out the prongs you need to fit the foreign outlet. 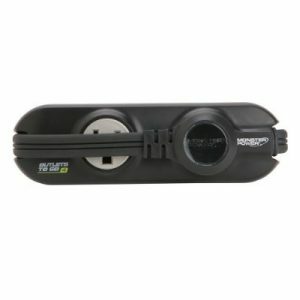 We use this adapter in conjunction with the Belkin Mini Surge Protector and the Monster Outlets-to-Go powerstrip described below. The Monster Outlets to Go is one of our favorite power accessories. If we’re taking our laptop on a trip, we’ll utilize it for the USB charging capability and take this instead of the Belkin Mini Surge Protector mentioned above. It’s much more compact and easier to pack. Plus it has one additional outlet and they’re spaced further apart for bulky charging devices. Monster will soon be coming out with a similar model, with a USB charging port, but one less outlet. When that happens, we’ll probably stop taking our Belkin along. If space and weight are big limitations, we highly recommend this for any type of travel. At less than an inch thick, you can’t go wrong.